Ok, my cat Stinky, is by far the most discriminating kitty around. And one thing that drives me crazy is that he doesn’t like Catnip. Now don’t call me an enabler, but I’ve tried just about all catnip, and nothing had an affect on my kitty. That is until I found the “good stuff” ! Sojos Premium Organic Catnip. This is super premium catnip. Hand grown and hand picked. Now what I’ve found out is that sprinkling a little bit of Sojos Premium Organic Catnip on your kitty’s bed or play area, wait 15 minutes and your kitty will be rendered to a groovy euphoric mood. Don’t use too much, only a little bit once or twice a week. 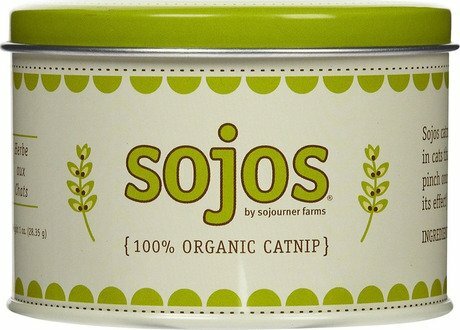 Sojos Premium Organic Catnip is super premium, but affordable. A 1oz tin is only $6. Go to http://www.sojos.com/catnip.html to order.